Boutique Executive Search Business. 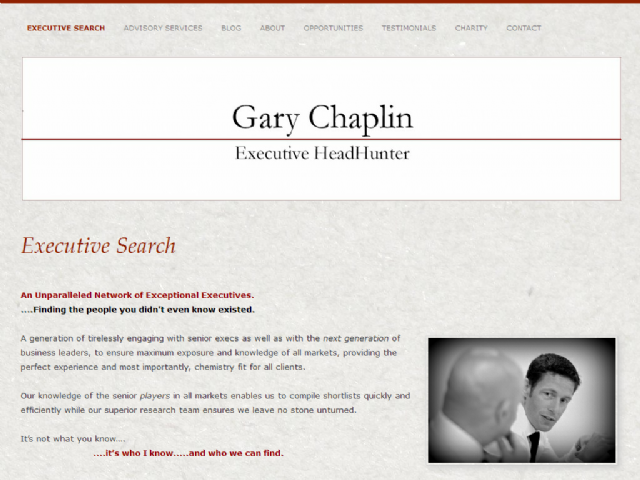 The founder, Gary Chaplin, is one of the best known HeadHunters in the UK and has almost 20 years recruitment experience, the latter fourteen of which have been in executive search. Having worked with a number of established search firms over that time, he set up in business in January 2012, to bring something different to the Executive Search market. The difference is the service he brings. An unparalleled network of contacts built up over 20 years and a unique skill in assessing chemistry fit between exec and business, leaves him in an unbeatable position to know, and find, key individuals for all manner of businesses.